The 2018 Municipal Election is shaping up to be an interesting and exciting race. A full slate of candidates are vying for all positions. The Chamber, as part of its mandate to advocate for local businesses and economic development is glad to host an all candidates meeting. 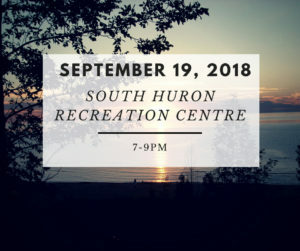 The all candidates meeting will be held at the South Huron Recreation Centre on September 19, 2018 from 7-9pm. We invite you to come out, participate and encourage you to develop questions for the candidates either ahead of time or after hearing the candidate introductions. Doors will open at 6:30pm. Questions before the event can be sent to the Chamber by email or by calling 226-423-3028. Written questions (form) will be reviewed and selected by a panel made up of Chamber and community members in order to ensure a relevant and balanced question period. Written questions will also be accepted during the event itself. To date, all candidates, with the exception of school board trustees (acclaimed), have responded that they will attend the event and are looking forward to engaging with the public. The meeting will be well structured and carefully regulated to provide interaction between candidates and the public in a professional and respectful manner. Paul Cuifo, of GC Financial Group will act as moderator. Please review the meeting code of conduct. Further questions or suggestions are welcome, please contact any member of the SHCC Board or Executive Director, Joan Brady at 226-237-3108 or the email below.